123 Marlborough is located on the north side of Marlborough, between Clarendon and Dartmouth, with 121 Marlborough to the east and 125 Marlborough to the west. 123 Marlborough was built in 1877 by J. and H. M. Harmon, builders, for Charles William Freeland, one of seven contiguous houses (121-123-125-127-129-131-133 Marlborough) built for him between 1877 and 1880, all in the same design and built for speculative sale. 121-123 Marlborough were built first, with the original permit application for the two houses dated March 3, 1877. 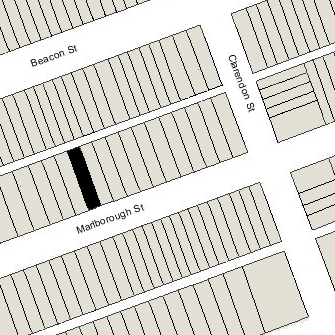 The architect is not identified on the original building permit application for 121-123 Marlborough, but Bainbridge Bunting’s Houses of Boston’s Back Bay attributes them to Peabody and Stearns, who are shown as the architects on the application for 125-127-129 Marlborough, built in 1879-1880, and for 131-133 Marlborough, built in 1880. Click here for an index to the deeds for 123 Marlborough. On September 3, 1878, 123 Marlborough was purchased from Charles Freeland by a trust established under the will of Samuel Johnson for the benefit of his son, dry-goods merchant Edward Crosby Johnson. He and his wife, Alice Trevett (Robbins) Johnson, made it their home. They previously had lived at 118 Marlborough. Alice Johnson died in February of 1891. 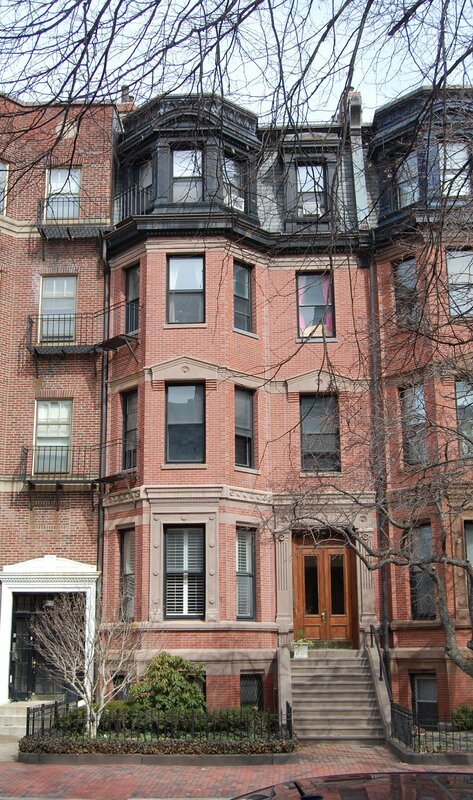 Edward Johnson continued to live at 123 Marlborough with their three daughters: Charlotte Howe Johnson, Alice Cornelia Johnson, and Mary Frothingham Johnson. Charlotte Johnson married in June of 1892 to Curtis Guild, Jr.; after their marriage, they lived at 124 Marlborough. Curtis Guild, Jr., was a partner in his father’s newspaper firm (publishers of the Commercial Bulletin) and later would become Governor of Massachusetts and US Ambassador to Russia. Alice Johnson married in May of 1895 to John Lavalle, an architect. He previously had lived at 183 Beacon with his step-father and mother, George Brune Shattuck and Amalia (Schutte) Lavalle Shattuck. They continued to lived with Edward Johnson until about 1904, when they moved to 353 Marlborough. Mary Johnson married in January of 1907 to Count Vittorio Orlandini-Guidi (called Orlandini), a lawyer. After their marriage, they lived at 123 Marlborough with Edward Johnson. On January 10, 1907, Edward Johnson acquired 123 Marlborough from his trustees (his brother, George Washington Johnson, and his nephew, Arthur Stoddard Johnson, son of Samuel Johnson, Jr.). Edward Johnson died in March of 1927. In his will, he left 123 Marlborough to his daughter, Mary Orlandini. Vittorio and Mary Orlandini continued to live at 123 Marlborough. Their adult son, Edward Orlandini, a real estate agent, lived with them. Vittorio Orlandini died in October of 1939. Mary Orlandini and Edward Orlandini continued to live there in 1940. Edward Orlandini married in February of 1941 to Elizabeth Leasure. On February 27, 1941, 123 Marlborough was acquired from Mary Orlandini by the Boston Children’s Friend Society. Earlier that month, prior to conveying the property, Mary Orlandini had applied for (and subsequently received) permission to convert the property from a single-family dwelling into offices for the organization. 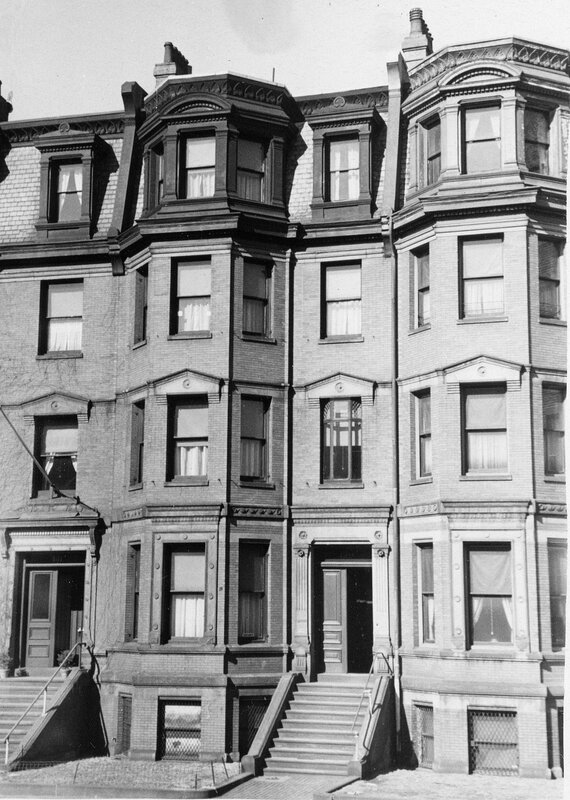 The Boston Children’s Friend Society continued to own and occupy 123 Marlborough until 1957. On May 27, 1957,, 123 Marlborough was acquired from the Boston Children’s Friend Society by Fred L. Arata, a retail liquor dealer and real estate investor. He and his wife, Annette Flossie (Crovo) Boggiano Arata, lived in Brighton. On February 26, 1959, 123 Marlborough was purchased from Fred and Annette Arata by real estate dealers Stuart H. Hasting and Joseph A. Gautreau. In March of 1959, they applied for (and subsequently received) permission to convert the property from offices into ten apartments. On August 31, 1959, 123 Marlborough was acquired from Stuart Hastings and Joseph Gautreau by Edward M. Appelstein and Millard C. Webber, trustees of the H. Motley Real Estate Trust. 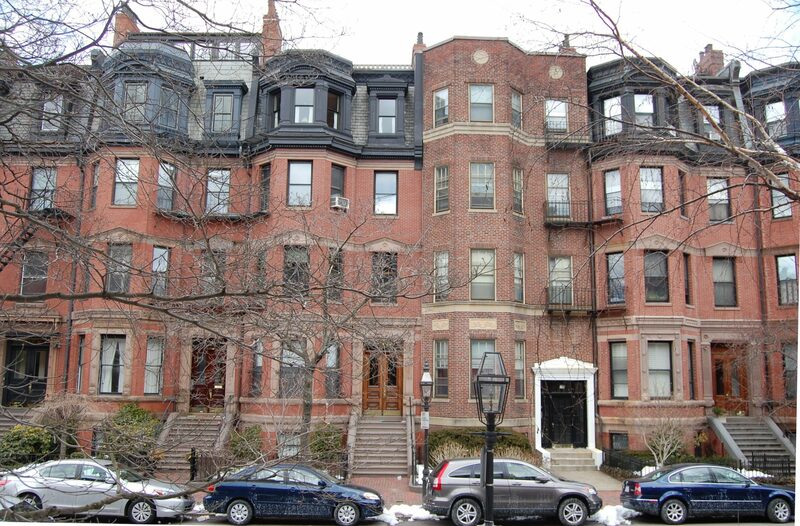 On June 20, 1980, 123 Marlborough was purchased from the H. Motley Real Estate Trust by Richard B. Cohen and Charles S. Rosenblum, trustees of the 123 Marlborough Street Trust. On December 5, 1980, they converted the property into ten condominium units, the 123 Marlborough Condominium.